Takamatsu Toshitsugu, the last shinobi, who influenced the modern budô world and some associated traditional martial arts schools. Takamatsu united in one single person a number of traditional martial arts systems and took these from Japanese medieval times into modern age. 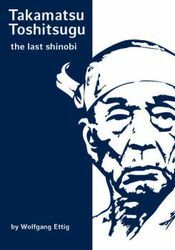 This book does not only describe the eventful life of two restless men who considered themselves to be the last shinobi but also delivers fascinating insights into the historical backgrounds of Japan on the threshold from medieval to modern times.